The American work ethic can basically be boiled down to one well-worn phrase: " Work hard, play hard ." But new research from a pair of Stanford University economists suggests we are failing, miserably, at the latter half of that maxim. Take a look at the chart below. 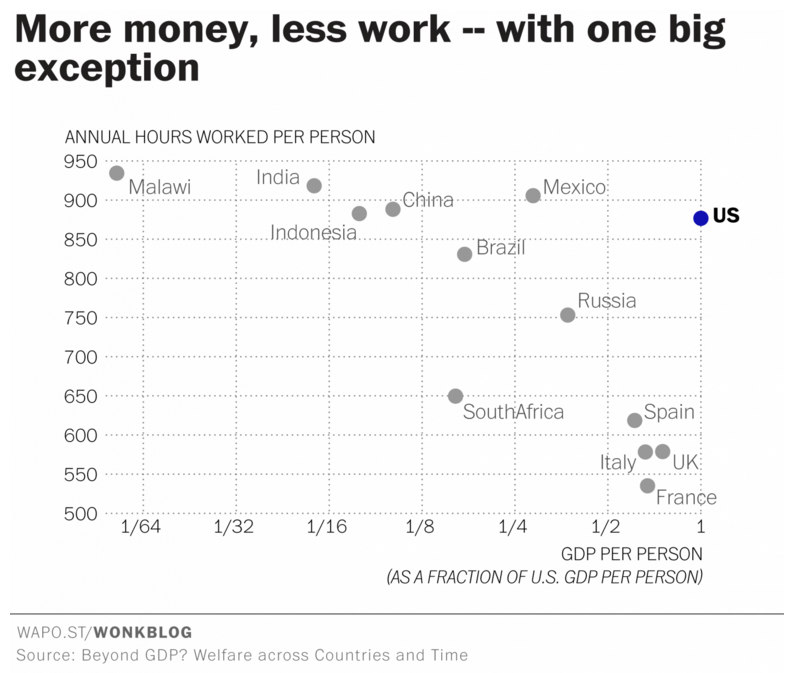 It's a plot of hours worked per capita versus GDP, and one country really stands out. As countries get wealthier, their annual hours worked per capita tend to decrease, at least in the sample examined here by economists Charles Jones and Peter Klenow. They measure GDP in fractions of U.S. GDP, because they're most interested in how other countries stack up to the United States in terms of economic well-being. For instance, Russia's GDP per capita is less than half of that in the United States, so it lands halfway down the chart's X axis. The relationship between GDP and working hours harkens back to economist John Maynard Keynes' famous prediction that his grandchildren would be working 15-hour work weeks -- thanks, in part, to increased productivity from new machines and technology. Since you're probably reading this story at your office or on your commute, you're well aware that things didn't exactly work out this way . We didn't trade our productivity gains for more time, we traded them instead for more stuff. But the extent of that trade-off -- time versus stuff -- hasn't been the same in all countries, as the chart above illustrates. "Average annual hours worked per capita in the U.S. are 877 versus only 535 in France: the average person in France works less than two-thirds as much as the average person in the U.S.," Jones and Klenow write. You see similar numbers in Spain, Italy and the United Kingdom. For a long time we've used our stuff to justify our workaholism. "Sure, the French may have day care and five-week vacations and 35-hour work weeks," we've argued. "But we've got flat-screen TVs, $5 footlongs and big cars." Or, in strictly economic terms: "France's per capita GDP is only 67 percent of ours. Who's living the good life now?" But in their new research, forthcoming in the American Economic Review, Jones and Klenow attempt to devise a "a summary statistic for the economic well-being" that goes beyond GDP. Economists have proposed alternative measures incorporating everything from " greenness " to " gross national happiness ." The Stanford economists make the latest contribution to the genre with their measure that "combines data on consumption, leisure, inequality, and mortality." They find that when you throw these other qualities into the mix, the economic well-being gap between the United States and other wealthy countries shrinks -- but it doesn't disappear completely. "Living standards in Western Europe are much closer to those in the United States than it would appear from GDP per capita," Jones and Klenow conclude. "Longer lives with more leisure time and more equal consumption in Western Europe largely offset their lower average consumption vis a visthe United States." So, even when you factor in our ridiculously long work weeks , the things we miss out on when we work long hours , and the myriad ways that overwork is killing us , the United States is still No. 1! Which is irksome, I'm sure, to the millions of French workers who spend literally the entire month of August at the beach.